Eye injuries are one of the most common workplace injuries, accounting for 2.5 million eye injuries annually in the United States alone. Out of this group, 50,000 people permanently lose part or all of their vision (United States Eye Injury Registry Summary Report, 1998-2002). Eye injuries are the number two leading cause of blindness, second to cataracts. The most staggering realisation about these statistics is that 90% of eye injuries can be prevented by wearing protective eye equipment. Eye injuries cost industry billions of dollars in workers compensation claims, lost work days and lost productivity. Injuries to the face, including disabling and non-disabling eye injuries, can cost an average of $17,187 per total claim and account for 33,010 lost work days in the United States (Injury Facts, 2010). On top of the cost to industry, eye injuries have a devastating affect on the injured worker as well as your workforce. Without any in-depth explanation needed, the trauma of losing one’s eyesight is devastating. It also affects the morale of co-workers. Employees who lose some or all of their eyesight may never be able to work in the same occupation again. It will completely affect his or her life, both at work and personally, forever. Implementing a strong eye safety awareness initative and use of personal protective equipment for the eyes and face in the workplace is critical to reducing the amount of occupational eye injuries. However, it is estimated that half of all eye injuries occur off the job. It is increasingly significant to stress the importance of applying best safety practices to activities that occur outside of work. If an employee injures themselves working around the house, he or she will have lost work days and/or restricted time. People often overlook the potential hazards associated with the use of chemicals and power tools in their home, especially workers who are not exposed to these hazards on a daily basis, such as office workers and delivery drivers. The type and severity of eye injuries range from small scratches which heal in a few days to chemical burns that can cause permanent blindness. Eye injuries are usually the result of direct contact with an irritant to the eye. The irritant may come directly from the source to the eye, in the event of a chemcial splash or debris from an activity, or be transferred to the eye from a soiled hand, arm or other means. Chemical exposures and burns occur when a toxic substance makes contact with the eye. Acids, alkalis (such as lye found in drain cleaner and ammonia), strong solvents and cleaning agents, and other industrial chemicals are highly caustic and can cause severe damage. These are the more obvious eye irritants and they can also irritate the respiratory system and skin when not handled correctly. It is easier to overlook the common chemicals, such as sunscreen and soap. Although these rarely cause any permanent damage, they can still irritate your eyes for many days. Often the result of a splash of liquid getting in the eye, a chemical burn can occur in a number of ways. Rubbing your eyes can transfer chemicals from the skin on the hands or arms to your eye. Aerosol exposure is another method of exposure. Dusts, fumes and mists are created by jobs such as painting, woodworking and scaling. Although not as common as flying particles, these hazards are serious because they are often too small to see. Sunscreen or lotions can easily seep into the eyes, especially when working in very warm environments. When working with or near these types of hazards it is important to know where the closest eyewash station is located. The amount of damage suffered from a chemical splash depends on how long the chemical is in contact with the eye. Thoroughly flush the eyes for 15 minutes to completely dilute the chemical. The cornea can be thought of as special, transparent skin that covers the eye. A corneal abrasion is, in effect, a scratch or an abrasion of that specialised skin. Corneal abrasions are the most common type of eye injury and are usually overlooked, mainly because most heal by themselves within a few days. Corneal abrasions are caused by a foreign object making contact with the eye and can be classified as traumatic, foreign body related, contact lens related, or spontaneous. Traumatic corneal abrasions are often caused by fingernails, pieces of paper or cardboard, or hand tools. Foreign body abrasions are typically caused by pieces of rust, wood, glass, plastic, fibreglass, or vegetable material that have become embedded in the cornea. Symptoms range from a mild feeling that something is in your eye (foreign body sensation) in cases of small abrasions to severe pain in large abrasions. Symptoms typically begin instantly after trauma occurs and can last minutes to days, depending on the size of the abrasion. Tearing can also occur. If a flying object does become imbedded in the eye, contact the proper medical personnel immediately. Cover the eye with a plastic shield or inverted cup, keeping pressure on the eye and eye movement to a minimum. This type of injury can occur in the same way as a corneal abrasion. It is also associated with a blow to the eye from a more blunt object. The iris is the colored part of the eye. It is actually a muscle that controls the amount of light that enters the eye through the pupil. Iritis simply means that the iris is inflamed. The differentiating system is an aching feeling, versus the foreign body sensation of a corneal abrasion. Some patients may experience headache and acute blindness. Iritis can manifest after a few days following a corneal abrasion. These injuries are associated with significant force from a blunt object to the eye and surrounding structures. Examples would be getting hit in the face with a baseball or smashed in the face with work equipment. Lacerations can occur to the eyelids and cornea. They are commonly caused by contact with a sharp object, including shards of glass. Interestingly enough, they can also occur from the trauma to the body caused by a fall. Corneal lacerations are usually the result of the blunt force trauma of a foreign object entering the eye. An example would be a small metal fragment flying into the eye when a person is using a grinding wheel without protective eyewear. Corneal lacerations are serious injuries that demand immediate medical attention to guard against permanent loss of vision. The most common light-induced trauma to the eye is ultraviolet keratitis, which can be thought of as a sunburn to the cornea. Ultraviolet and infrared light are at opposite ends of the colour spectrum, but are equally dangerous to the eyes. Many welding and cutting procedures emit these dangerous light rays. Generally, a foreign body is a small piece of metal, wood, or plastic filing. It could be anything that gets into the eye. Foreign bodies in the eye are the cause of the majoriy of eye injuries already covered in this article. Definitions for foreign body injuries depend on how the foreign body comes in contact with the eye. Intraocular foreign bodies are injuries in which the globe of the eye has been penetrated by the object (Eye Injuries Causes, 2010). Eye injuries can happen to anyone in any industry, but are most common in the process, manufacturing and construction industries, where workers have a higher chance of coming into contact with foreign objects, chemicals, equipment and machinery. Eye injuries occur in large rates in industries that you may not consider, such as retail trade, education services and leisure and hospitailty. Injuries in these industries tend to be less serious and more likely result in corneal abrasions. The speculated reason for somewhat high occurances in these industries is the lack of engineering controls and enforcement of eye protection use. It is not often you see a worker in your local supermarket loading bags of cat litter onto the shelf and wearing eye protection. However, should a bag break open during this process, the litter could get into the worker’s eye and cause a scratch or abrasion. In the European Union, the legislative framework is established by the European Commission through a series of European Directives based in Article 137 of the EU Treaty, giving the EU authority to legislate in this field. The EU regulates the specifications for eye protection in the ‘harmonised standard’ adopted by the European Committee for Standardisation (CEN), EN 166. Other standards include, EN 165, EN 168, EN 169, EN 170, EN 171, and EN 172. Although there may be variances to regulations in specific countries, the personal protective equipment standard and subsequent eye protection standard is common among all countries that have a set occupational, health and safety directive. According to statistics, in three out of five eye injuries the worker was not wearing safety glasses. Most eye injuries can be totally prevented by the proper use, care and practice of wearing eye protection. In this article, we’ve outlined the traumatic injuries that can result from not wearing eye protection. 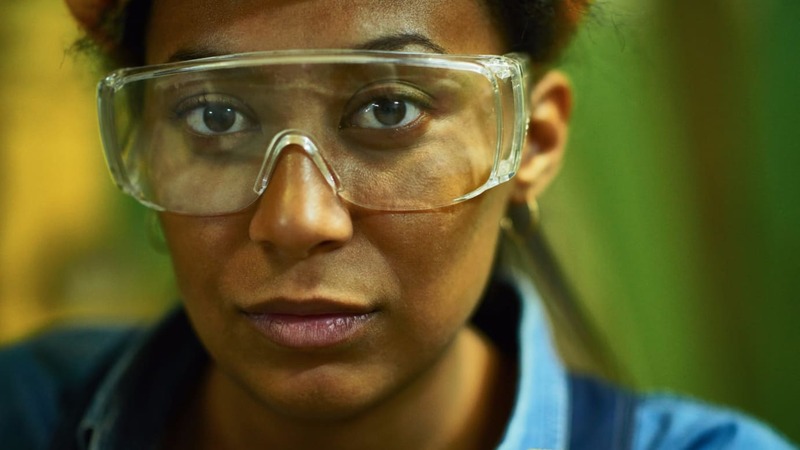 One of the most important things you can do to prevent the loss of sight or damage to your workers’ eyes is teach them the proper way to incorporate eye protection into their work tasks. It is not only the right thing to do, but a compliance regulation set forth by government bodies in countries where safety standards exist. In the work environment, there are very few situations where eye protection is not necessary. Although the particular task at hand may not require eye protection, areas near the operation may prove hazardous. About one third of eye injuries occur to nearby co-workers. It is important to note that personal protection is a supplement, not an alternative to machine guards, engineering controls and safe work practices. The typical work environment is divided into many different areas, each designed to accommodate specific tasks. All areas where eye hazards exist should be noted as part of your hazard assessment. Look for areas where flying particles, dust, fumes, mists, splashing metal, hazardous chemicals and vapours, and ultraviolet and infrared light are present. In any hazardous environment where eye injuries are possible, workers are required to wear eye and or face protection. Eye protection falls into two different categories: primary protectors and secondary protectors. Primary protectors include spectacles, commonly referred to as safety glasses and goggles. Face shields and welding helmets are considered secondary protectors and must be worn with the appropriate primary protector. The type of protection required is also determined by a hazard assessment of the job. Safety glasses are the most common type of eye protection found in the work environment. They are designed to provide primary protection from a number of different hazards. It is important not to confuse safety glasses with regular prescription glasses. Safety spectacles are made of a tough, slow burning material designed to withstand severe impact while keeping the lenses intact. In many industries, side shields and brow bars are required as well. They offer further protection and are highly recommended. Goggles are designed to completely surround the eyes and shield them from various hazards. They are available in two styles: eyecups, which cover the eye socket completely, and cover goggles, which may be worn over spectacles. Goggles are usually ventilated, either directly or indirectly, to allow the passage of air to minimise fogging. Direct ventilation goggles are equipped with a series of holes on the tops and sides. They are effective against flying particles, but are not designed to block fine dusts and chemical splash. Indirect ventilation goggles offer more protection against splashes. Face shields guard the entire face from flying particles and chemical splashes. Since face shields are considered secondary protection, they must always be used in conjunction with safety spectacles or goggles. Finally, welding helmets are designed to shield both the eyes and face from optical radiation and impact. Helmets can be mounted on hard hats in either a stationary or lift front style. They are also offered in hand shield style. Like face shields, welding helmets are secondary forms of protection and must be worn with either safety glasses or goggles. Although there are a number of different types of protection for the eyes, they do share some common qualities. Before eye protection can be worn, each item must be put through a series of tests to ensure they work properly. For example, a pair of industrial safety glasses must be able to sustain impact from a one inch diameter steel ball dropped from a height of 50 inches. They must also be able to withstand impact from a steel ball traveling at 150 feet per second. These tests are designed to simulate real-life situations you may encounter in the work environment. They do not, however, remove all responsibilities from the final user. Impact resistance ratings are promulgated by regulatory bodies, such as the American National Standards Institute (ANSI), Occupational Safety & Health Administration (OHSA), and the European Committee for Standardisation. These entities have standardised tests for eyewear impact resistance. Testing is usually conducted by the eyewear manufacturer or an outside product testing firm. Eye protection is divided into classes or scales based on the final use of the product. Your regulatory safety and compliance agency provides the guidelines to determine what job tasks require what level of eye protection and to be compliant with your government’s requirements. Protective eyewear must be kept clean and in good condition. Lens cleaning stations must be placed throughout the facility and used on a regular basis. Before each use, eye protection must be inspected for any chips or cracks. This can decrease the structural integrity of the eyewear. If a worker notices any problems with the eye protection, or irritation during wear, they should be replaced immediately. Worn or broken eye protection should be disposed of. Although there are a variety of different hazards in the work environment and off the job, eye injuries can be prevented by following some common sense rules. First, recognise and respect all of the eye hazards present at your facility. Next, wear the appropriate protective eyewear at all times. This may include spectacles, goggles, face shields and welding helmets. Make sure protective eyewear fits properly and is clean and in good condition before and after use. Lastly, ensure eyewash stations are located throughout the facility and employees are aware of their location. An eyewash station could be the difference between sight and blindness. By understanding the causes and consequences of eye injuries, and following best practices for wearing eye protection, your worksite can prevent life changing eye injuries. Ensure your workers set their sights on safety in everything they do. CDC, U. (2010). Eye Safety. Atlanta: NIOSH/CDC. Injury Facts. (2010). National Safety Council. (1998-2002). United States Eye Injury Registry Summary Report. Sara Wesche has been with Summit Training Source for more than nine years. Her creative skill and expert writing abilities led her to the Marketing Specialist position, and ultimately to managing the marketing department in 2003. Sara’s focus has been developing Summit’s World Wide Web presence, to generate sales leads through multiple medias, and to create marketing support materials that solidify Summit’s position as the complete EH&S training solution provider. Sara graduated from Michigan State University with a Bachelor of Arts in Communication. Sara can be reached at SaraW@safetyontheweb.com or at SafetyTraining1 on Twitter. Summit Training Source has been an environmental, health and safety training innovator for more than 29 years. In excess of 40,000 clients worldwide trust the health and safety of their employees and work sites to Summit’s expert training capabilities. With at least 600 environmental, health, and safety training titles in multiple formats, including Online, DVD, Streaming Video, Summit Elements, and Online OSHA accepted 10 & 30 Hour, Summit provides proven content that delivers the business results expected in today’s competitive global environment. Summit programmes create an awareness and respect of workplace hazards and reduce incidents, accidents, and their associated costs. Summit was the first training provider to offer interactive CD-ROM training, leading the way into the interactive technology age. Summit’s online platform, Summit Trainingweb®, offers customers global consistency, 24/7 availability, and is based on adult learning theories to create a more comprehensive and engaging programme. Summit’s Online OSHA 10 & 30 Hour training for Construction and General Industry has been authorised by OSHA. Summit’s programmes are effective, offering a return on investment to customers. Our continued mission is to provide the highest quality training programmes available, meeting industry needs and complying with all regulatory guidelines, enhancing the future productivity, growth, and bottom line results for all our customers.